Like a grapevine twining up a trellis, NMC’s collaborative viticulture program is growing tendrils of its own and is poised for a growth spurt this summer. Two students in the five-year-old program are breaking new terroir with their summer internships. Kurtis Berry (right)(above) is the first to intern overseas, at Vignamato winery and vineyard in Marche, Italy, while Ethan Baker (below) is the first to head to the Pacific Northwest. He’ll spend his summer at Winemakers, LLC, a vineyard management company in Washington’s Yakima Valley. Worldwide, the wine industry traces its history back hundreds of years, so those are impressive placements for students from a program that just began in 2010. Viticulture is the newest plant science certificate option offered by Michigan State University at NMC’s University Center. About 28 students are now enrolled, simultaneously pursing an associate’s degree from NMC and an MSU viticulture certificate. 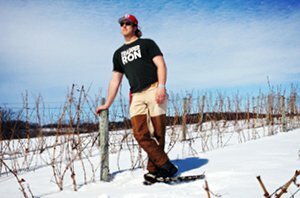 Berry and Baker will complete their internships while on hiatus from their jobs in the regional wine industry, at Brys Estate and 45 North, respectively. The latter is named for the 45th parallel of latitude, which makes both northwest Michigan and Washington suited to grow wine grapes. “I chose Washington because, parallel-wise, it’s very similar to Michigan,” Baker said. Yet the industry there operates on a completely different scale. Winemakers LLC manages about 1,200 acres of vineyards — equivalent to almost half the wine grape acreage in the entire state of Michigan. “It’s not an experience I could get in this area,” Baker, 22, said. That’s exactly the point, said viticulture program coordinator Brian Matchett. “Our industry, the grape and wine industry in Michigan, is going to be stronger if you have experiences in another part of the country, or another part of the world,” Matchett said. Berry, 25, is equally enthusiastic, even though he doesn’t speak much Italian. Both students will return to Traverse City in August. 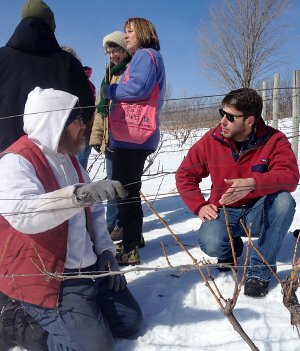 Baker plans to graduate from the viticulture program this December and Berry in May 2016.